Also available for online streaming or download click here. Awesome! Whether you believe in The Rapture or not, Pastor Billy Crone will not only prove beyond a shadow of a doubt that it is real, but will convince you that it can only be a Pre-Tribulation Rapture designed to rescue Jesus' Bride (the Church) from the coming wrath of God. A "must see" along with Pastor Billys series on Noahs Flood. God hates sin. He judged the world once and he will do it again. He saved Noahs family with the Ark and will save His Bride with The Rapture. Get both series, get convinced and get saved before its too late! I received this DVD set and absolutely love it so far. It's the best Rapture series I've ran across. If you want to learn about The Rapture then you will not be disappointed. 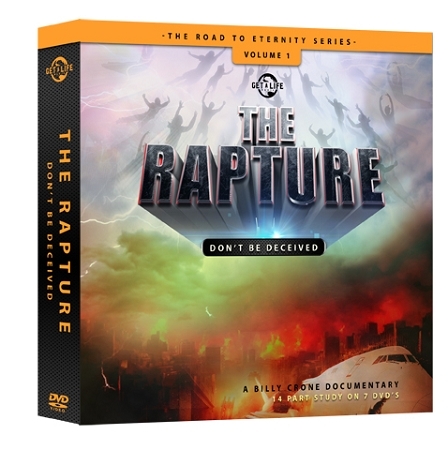 What a great teacher Billy Crone is and with this DVD set, he answered just about every question that has been asked regarding the versions of the rapture; the pre-trib, mid trib, pre-wrath, and post trib. After watching these and studying the word along with Billy Crone, I feel I can answer those questions and "comfort one another with these words."